Posted by HubTechInsider in Investing, Management, Manufacturing, Massachusetts High Technology, Military Contracting, Technology. There are 13 companies listed in this year’s Fortune 500 index of America’s largest corporations. 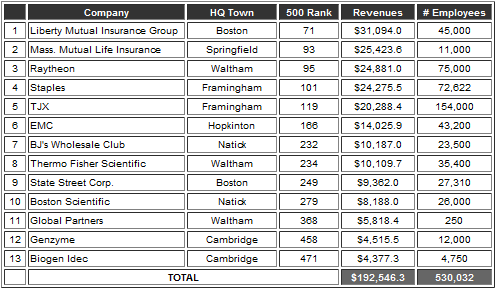 The chart below lists all 13 Massachusetts-based companies that are in the Fortune 500, their headquarters town in Massachusetts, their rank in the Fortune 500, their 2008 revenues (in millions), and number of employees. We can see that the 13 corporations in the Fortune 500 index of America’s largest corporations that are based in Massachusetts had combined 2008 revenues of $193 Billion dollars and employed a combined 530,000 people worldwide. Waltham was the Massachusetts city with the most Fortune 500 company headquarters based within its borders, with three of the companies listed being based in the Watch City. 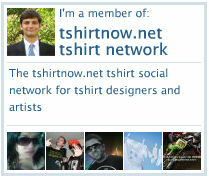 Two were based in Cambridge, two in Framingham, two in Natick, two in Boston, and one each in Springfield and Hopkington.